MTSU Golden Raiders celebrate .. In MTSU’s James E. Walker Library, it’s possible this fall to make a joyful noise unto the Lord without creating a disturbance. The library has teamed up with the Gospel Music Association, the MTSU Center for Popular Music and the MTSU School of Music to present an exhibit of gospel music artifacts on the library’s first floor through the end of the fall 2017 semester. “I am very pleased with the collaborative effort … in bringing this wonderful exhibit to MTSU,” said Dr. Cedric Dent, a music professor and member of the GMA Foundation Board of Directors. Dent was inducted into the Gospel Music Hall of Fame in 2014 as a member of the vocal group Take 6. 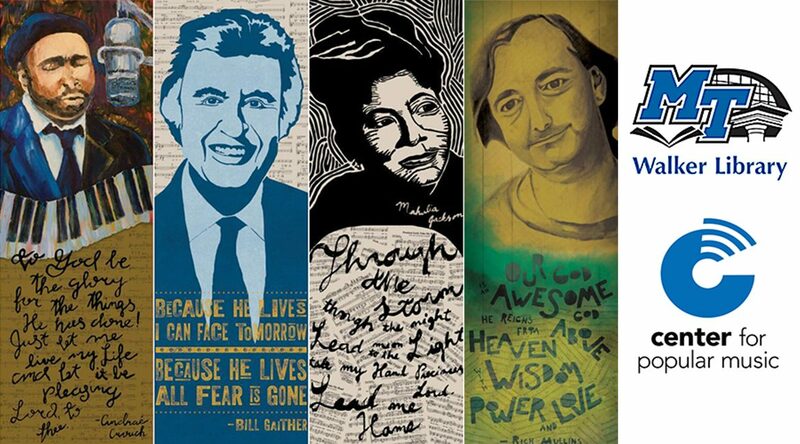 Fellow inductees Mahalia Jackson, Bill Gaither, Andrae Crouch and Rich Mullins are featured prominently on artistic tapestries in the new exhibit. Glass cases house items ranging from an LP of hymns sung by Tennessee Ernie Ford to a copy of the Gospel Metal fan magazine. “Our portion of the exhibit showcases the diversity of our collection in terms of the types of items you can find … from photographs to various sound recording formats to posters and programs, all relating to one facet or another of gospel music,” said Olivia Beaudry, an assistant archivist for the Center for Popular Music. Christian rapper nobigdyl kicked off the gospel exhibit celebration with a Sept. 26 performance on the Student Union commons. The artist, whose given name is Dylan Phillips, was raised in Bell Buckle, Tennessee, and graduated from MTSU in 2013. More scheduled performances include concerts by the MTSU Women’s Chorus under the direction of voice instructor Angela Tipps at noon Tuesday, Oct. 10, and the Trinity Jazz Ensemble, performing with Dent, under the direction of School of Music Director Michael Parkinson at noon Tuesday, Nov. 14. Both concerts will take place in the Walker Library atrium and are free and open to the public. Grover Baker, visual and performing arts librarian, was instrumental in scheduling the performances. For more information, contact Clay Trainum at 615-898-5376 or clay.trainum@mtsu.edu.